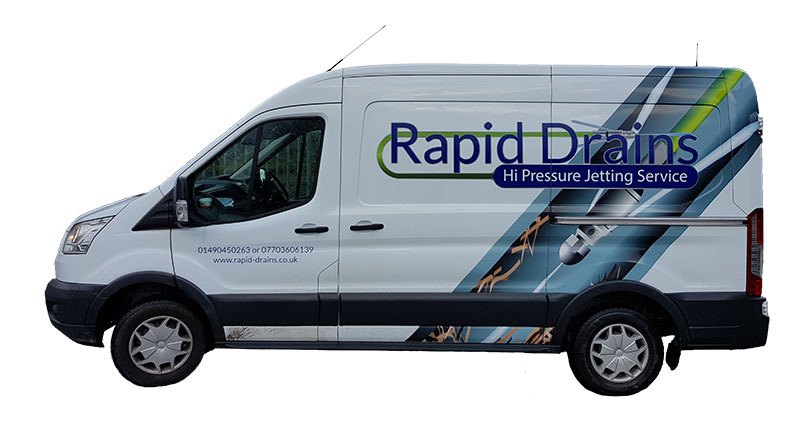 Rapid Drains is a family run business with over 40 years experience of Jetting Drains and emptying and installing septic tanks and treatment plants. We offer an emergency High Pressure Drain Jetting Service covering Denbighshire, Flintshire, Wrexham, Shropshire, North Wales, Cheshire, Wirral North West. We are able to work with home owners and businesses to provide a Rapid and Quality service, whatever the problem is. Problems with blocked drains, clogged toilets, slow running sinks or baths. Drain repairs are often missed & can cause secondary problems. Damaged drains can attract rodents, can smell or worse still, leak into foundations causing potential problems with the fabric of the building. From a leaking pipe to a damaged water main, unbeatable service is at hand 24/7. Our van comes fully equipped to deal with any plumbing emergency from broken taps to a toilet that wont flush. We can offer Homebuyers CCTV Drain Report, priced competitively, which gives you peace of mind when buying your dream home. Rapid Drains are specialist in underground moling and trenchless technology. Moling is a method of laying pipes or cables under ground were a pneumatically driven machine known as an impact mole forces a path through the ground displacing the soil rather than removing it. For Commercial plumbing and drainage our team will work alongside www.awrenewables.co.uk for any plumbing bookings. 24 hour service available for emergencies, both commercial and domestic. We will always conduct surveys in advance to ensure that you are being quoted for relevant work.